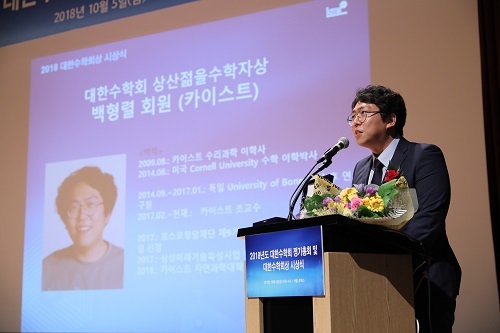 Professor Hyungryul Baik from the Department of Mathematical Sciences was honored as the recipient of the 2018 Sangsan Prize for Young Mathematicians by the Korean Mathematical Society (KMS). The Sangsan Prize recognizes young mathematicians who finished their degree within the previous five years and have begun an outstanding research career. Professor Baik was recognized for his studies in the fields of low-dimensional topology, geophysical mathematics, and geometric theory. In particular, his Ph.D. dissertation presented a new criterion that completely identifies the hyperbolic surface group, making an inference about the nature of the hyperbolic manifold group. Recently, Professor Baik co-published a paper entitled Spaces of Invariant Circular Orders of Groups with Professor Eric Samperton at the University of California Santa Barbara in the renowned academic journal Groups, Geometry, and Dynamics in 2018. Professor Baik earned his BS at KAIST and finished his MS and Ph.D. in mathematics in 2014 at Cornell University. He joined KAIST as a faculty member last year.